We got up about 8:30 a.m. and went downstairs for breakfast, which included the exact same items as yesterday’s breakfast. After breakfast we left the hotel and walked to Leicester Square, which was the designated loading point for the tour bus we had booked prior to arriving in London. There are at least two tour bus companies in London which operate double-decker buses that you can pay to ride for a 24 hour period. Both companies seem to have very similar offerings, including multiple bus routes, live and prerecorded guided tours, pre-purchasing of attraction tickets, free guided walking tours and free River Thames cruises. The tour bus company we chose was The Original Tour, which charges £18 per person, per day. The other tour bus company is The Big Bus Company. They charge £20 per person, per day. We reached Leicester Square but didn’t see the specific location for catching the bus. There was an information booth and we asked where the buses departed. We had to walk a block or so and found a couple of buses lined up. At some of the tour bus stops personnel are there to sell tickets to anyone who wants to get on board. We had a prepaid pass that we had to turn in and the ticket lady printed our individual boarding passes with a portable printer. 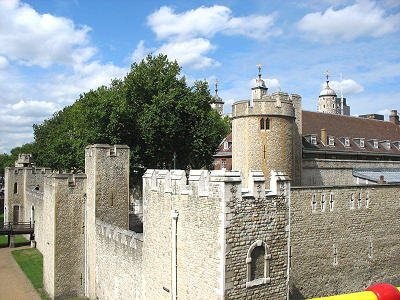 We were also able to purchase tickets to the Tower of London from the ticket lady. They sell tickets to several different attractions which can save you a great deal of time because you don’t have to wait in line to purchase tickets when you actually get to the attraction. At the time we went to London they were selling tickets for Madame Tussaud’s, the London Dungeon, the Tower of London, Kensington Palace, and the London Eye. The tickets aren’t discounted, but again, you avoid waiting in line at the attraction itself. They also sell discounted passes for eating at three different restaurants around the city. We got our tickets and boarded the bus. The weather was beautiful today so we decided to ride on the top of the bus. 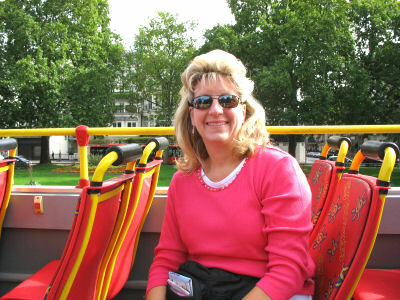 Frankly, this was one of my very favorite things to do in London. We had a live tour guide on the bus and she gave tidbits of trivia regarding different buildings, statues and parks that we were passing. I thoroughly enjoyed being able to simply sit back, relax and take in the sights of a new city. The drive time to the Tower of London was approximately 30 minutes. The bus tour winds its way through London, so it’s not a direct drive to the Tower–and that’s fine. We wanted to see more of the city. On this day there was not a line at the ticket office at the Tower of London. However, I’ve heard that the line can be quite long so it’s best to purchase tickets in advance if you can. We went into the gate where our bags were searched. Security is taken seriously here. 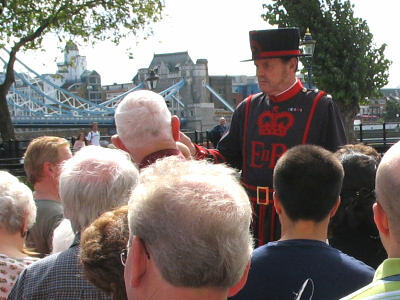 Just as we walked in we joined a large crowd of people who were listening to one of the tour guides, known as Beefeaters. The Beefeaters wear a traditional red coat and hat, and are required to have at least 23 years (I think that’s the number) of unblemished service to the military. The guided tour lasted around one hour and we learned details about the history of the prisoners who were kept here and/or beheaded here. The guided tour ended in the chapel. We tipped the Beefeater as we left the chapel. Once the tour was over we were free to roam around the Tower of London. By the way, the Tower of London attraction is not just one big tower. It is a huge conglomeration of buildings, towers, protective walls, etc. The first thing we did was to visit the crown jewels, which are stored in a vaulted section of one of the buildings. Photographs are not allowed inside the area where the crown jewels are kept, so I can’t show you pictures of those. The crown jewels are the actual crowns and other jewels used by the royalty over the centuries. They really were quite stunning and beautiful. Two moving sidewalks take you on either side of the crowns so that the line does not get backed up. There is a walkway in case you want to go back for another look at the crowns. There are other gold implements used in various ceremonies, as well. The giant “punch bowl” was eye-popping. 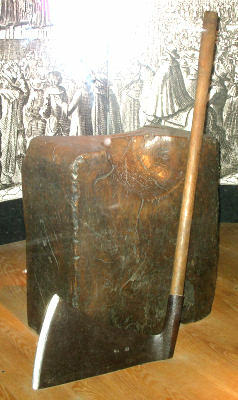 The accompanying ladle must have required two people to lift it. After our snack we continued looking around the grounds, which have a surprisingly large number of interesting things to see. Many of the passageways and stairways are marked one way only, which can be frustrating if you cannot locate the entry point, but it does keep traffic flowing in an orderly direction. Some parts of the passageways are simply too small for people to walk in both directions. Be sure to get a map so that you can locate the different entry points for all of the different parts of the Tower of London. Otherwise you might miss entire sections.